This colorful new image from the MPG/ESO 2.2-metre telescope at ESO's La Silla Observatory in Chile shows the star cluster NGC 3590. These stars shine brightly in front of a dramatic landscape of dark patches of dust and richly hued clouds of glowing gas. A nearby star cluster blazes against a backdrop of glowing gas clouds in a gorgeous new image from a telescope in Chile. 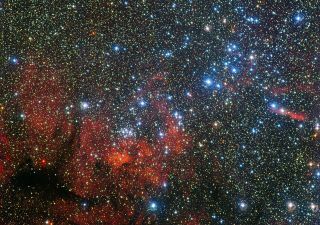 The new photo, taken by the MPG/ESO 2.2-meter telescope at the European Southern Observatory's La Silla Observatory in the Atacama Desert, shows NGC 3590, a small cluster containing several dozen stars that lies about 7,500 light-years from Earth in the constellation Carina (The Keel). You can see a video fly-through of the Carina star cluster here. "These spiral arms are actually waves of piled-up gas and stars sweeping through the galactic disc, triggering sparkling bursts of star formation and leaving clusters like NGC 3590 in their wake," European Southern Obsevatory (ESO) officials wrote in a description of the image, which was released today (May 21). "By finding and observing young stars like those in NGC 3590, it is possible to determine the distances to the different parts of this spiral arm, telling us more about its structure," they added. Stars in the cluster shine bright blue in the photo, while surrounding gas clouds glow red and orange, lit up by the radiation emitted by hot stars nearby. Countless background stars are also visible. ‪Astronomers captured the new image using the Wide Field Imager (WFI) on the MPG-ESO 2.2-meter scope. The photo combines multiple observations made in visible and infrared light using a variety of different filters, allowing researchers to capture many different colors. ‪Follow Mike Wall on Twitter @michaeldwall and Google+. Follow us @Spacedotcom, Facebook or Google+. Originally published on Space.com.